Contemporary with the body art and works of Gina Pane and Charles Simonds, this “sand experience” continues František Lesák’s research into the theme of perception. 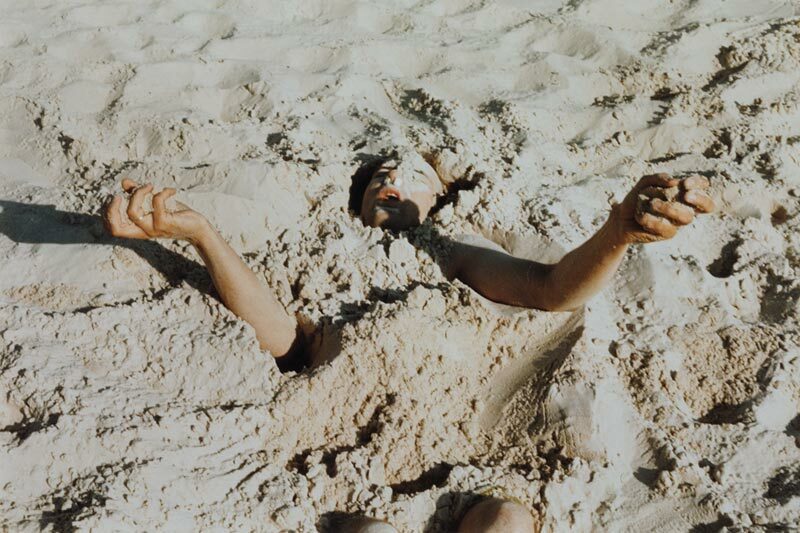 Here, in a radical manner, the artist experiences being deprived of space by immersing his body in sand, to the point of completely disappearing. The 15 photographs in the series catch the body’s gradual return to fresh air. If, for Lesák, this movement of emergence onto the earth’s surface represents a visual challenge in itself, the meaning of this performance is also linked to the state of physical and mental tension that follows confinement. The enclosure of the buried body sets up a negative space: “… space forms itself within the physical experience of the matter surrounding the body”, explains Lesák; this is what is shown by the two drawings which round off the installation, specifying the nature of the sensations felt by the artist. These experiments involving wrapping, where the surface of the body activates the surface of the art, are akin to those conducted by Land Art artists such as Dennis Oppenheim and Michael Heinzer.